Not having a soft clean musk for summer wasn't an option for me, and I was almost set to buy a full bottle of Serge Lutens Clair de Musc after trying a few samples. The problem was that Clair de Musc suddenly changed her attitude and started talking dirty as soon as the summer arrived. It was a big surprise for me because before summer she would just innocently murmur all day in her quiet musky tone. So the "easiest" Serge Lutens (At least that is the common reputation for Clair de Musc. Am I the only one who saw her animalic side? Just wondering) was out, and I remembered how I loved the small bottle of the original Narciso Rodriguez "for Her" I had a few years ago. I still remember it as one of the most beautifully blooming musks, although its tenacity did annoy me on a few occasions. I wanted something carefree and lighter than the original but didn't find the recent release from the same house that way. 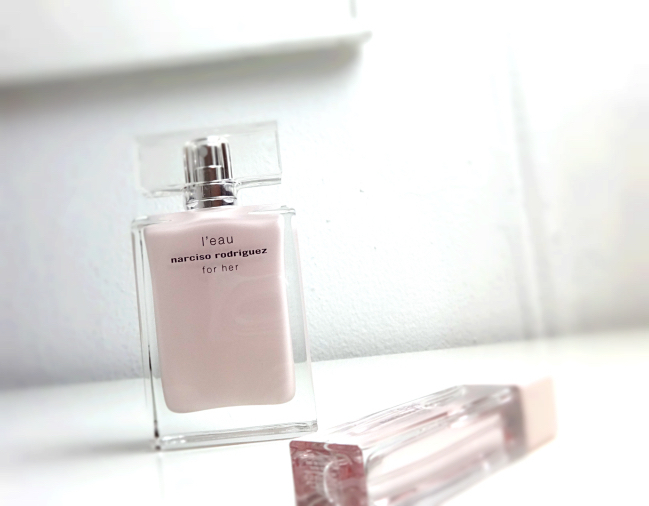 Narciso Rodriguez L'Eau was considered next, naturally. It is a flowery and airy version of the original which was introduced as a seasonal flanker many years ago. I thought it was interesting that L'Eau stayed unlike the other NR flankers. So I bought L'Eau after having tested it on skin one hot afternoon (summer is not the time when you can buy your perfume based on imagination, because not everything is about you). "A discreet and captivating fragrance that expresses a soft and innocent femininity, charged with tenderness as pure as water. For her l’eau is composed of a sparkling bouquet of flowers on a background of warm notes and sensual musks." Poet’s Jasmine, Cyclamen, Pink Peony, Rose and Lily of the Valley. It opens with a bouquet of flowers that feels light and almost aquatic. However, it has a big sillage and the enticing effect on others is pleasantly immediate. It is nearly impossible to grasp any muskiness in this initial stage so that I'd be worried that this is just another floral fragrance (they usually have some wood and musk base anyway). Then, the original "for Her" appears in a very soft and dear form to stay close to my skin for a long time. It actually is, at least for me. I have been constantly wearing this all summer and I don't think I will stop anytime soon. Granted, I like florals and usually find them easy to wear, but this is something that those who don't particularly enjoy florals might find do-able. Hi Wheetnee, if you like florals, definitely give this a try! It is very well balanced and pretty. 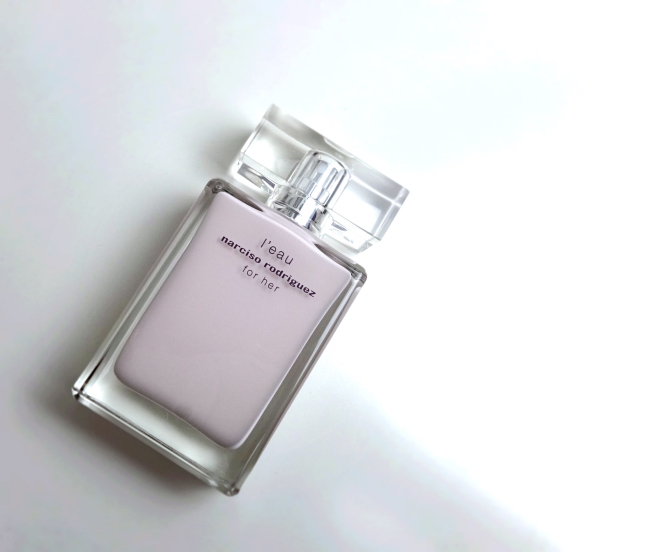 I love the original Narciso Rodriguez for her, but this one sounds really nice as well I need to give it a try!! I'm glad to hear you like this one! You are so right: when it comes to fragrances, it's never all about you. Glad to hear you found a clean scent for summer! Clair de Musc was all foggy, coy and mysterious on me and I got exasperated. Glad you found this! I always wanted to like NR perfumes more than I actually do and was sad about it, haha. I will try and stop for a while. I actually put in too much effort in the current design so don't think I can go through that anytime soon. Hate that my template is not mobile responsive that I have to use one of the generic designs, though. I'm still sad that I missed out on the Guerlain Terracotta (Totally my fault since it was restocked on Neiman Marcus twice and I still didn't act fast enough), but L'Eau kind of makes it alright. This sounds like a wonderful summer scent! I think I've sniffed this one before and did like it! The floral notes in this is definitely juicy but never sweet which I think why it is never cloying even in the hot weather. I have many musk based fragrances but a few of them started smelling a little off and heavier than before. I suspect that my body chemistry has changed too. I enjoy L'Eau but I'm more glad that people around me enjoy this as well! Ooo, I'll have to check this out. I'm such a sucker for clean and minimal packaging though. I think this would look so pretty sitting on my dresser! Haha, how a perfume bottle looks on one's vanity is a totally valid factor! And YES, summer heat and humidity do all kinds of weird things to my perfume picks, as well. Sometimes they turn favorites into brash, annoying, obnoxious things, and I have to put them away until winter :P But sometimes it's okay. SL Clair de Musc was horrible on me, btw. Hahaha. This one sounds pretty but I think I've tried the original and didn't love it...musks are sometimes hard for me to handle. It is nice to have a carefree summer scent, though! This summer I've been wearing Diptyque Eau Duelle. Thanks, Larie! It was really about adding some texts to an image so it was super easy! I left a similar comment to your recent perfume post, but now I understand why Clair de musc could be wild in the heat. Serge Lutens says "a wild beast tamed"! LOL The iris note in this works very well on me and it even smelled cold on my skin during winter, though. On the other hand, Eau Duelle is a vanilla I can do (it's a big deal) but it was quite loud on me when I tested it not too long ago. So interesting, right? This is why we can't stop wearing perfume. It's never boring! At the end of the day, this is still a quite complex must scent. If you like fruity notes, do check out the Delicate version since it has fig notes and is delicious.